Raising and training a dog can be one of the most rewarding pursuits that you’ll ever experience in life. These are truly our best friends and there’s also something in their natural instincts that will cause them to naturally want to roam. While this can be a relatively harmless instinct, it can also get your dog into a lot of troubling situations with wildlife, traffic, and environmental hazards. One great tool that will help you curtail your dog’s need to explore is a retractable leash. These types of devices give your dog a decent amount of roaming freedom, yet also makes sure that there is a limiting factor to their wanderings that will keep them safe. Since there are quite a few of these devices available today, we’ve taken the time to identify a few that are some of the best options on the market. Any Gold Pick product will have the support of both consumer groups and critics alike. Our Gold Pick retractable leash has some great design, staunch features, and sturdy build quality. Developed by the inventors of retractable leash, Flexi, you expect an attention to quality and pet safety that is second to none. Flexi was founded more than 40 years ago in 1972, when they produced the world’s first retractable leash. At the time, the device was comprised of wood but much of its design aesthetic is still present in retractable leashes today. As the one of Flexi’s latest entries into the world of electronic leashes, you can expect that this device is designed to keep the company’s well known quality in this market as a primary design attribute. Its primary aesthetic is sleek and comfortable feeling, with an ergonomic grip that at once supports your control over your dog and feels comfortable enough to grip for hours. 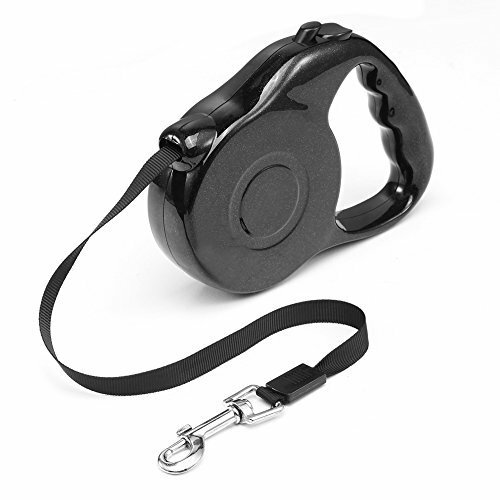 The grip itself has a wider center for easy gripping and the leash housing is relatively large and round, which is designed to support the fully wound 26 feet of leash that this device can deploy. Measurement-wise, this device is about 8 inches from front to back, 1.6 around, and the leash housing is about 5.2 inches in diameter. Insofar as weightiness, your hands shouldn’t get too tired hefting the retractable leash’s meager 1.2 pounds weight. A few complaints about the grip itself are that while there is a good gripping surface for this retractable leash, the actually grip area is somewhat smallish. This means that if you have a larger hand, you’ll have to possibly not have all of your fingers in the grip when you use the leash. Also, the grip itself is comprised of the hard plastic that composes the remainder of the retractable leash, meaning that the company didn’t coat it in a soft-grip material that will make it easier on the hands. These minor foibles aside, this is a quality retractable leash. It will work well with larger dogs like Rottweilers and Saint Bernards without much of a fuss, though for smaller dogs a leash of this build quality might be a bit of overkill. The weight limit on this retractable leash is 110 pounds, which should rein in all but the largest of pooches. The leash itself locks easily. To stop the leash from extending, simply depress the main button and as long as you are holding it the leash will stay put. If you want to lock the leash into position, simply slide this same button forward until it clicks, which will indicate that the lock is engaged. Finally, to unlock, simply pull back on the secondary button and extension will once again be possible. The whole locking system is very intuitive and locking and unlocking is accomplished in a smooth as butter way. The belt cord slot is U-shaped, which will help ensure that the leash itself doesn’t get twisted. The bolt snap that attaches to your dog’s collar or harness is strong and comprised of stainless steel that is thick enough to be nigh-unbreakable. The bottom line about this retractable leash is that it’s the perfect way to reign in a larger dog’s curious nature. Large breeds like Rotts can be a bit aggressive in their explorations and a sudden surprise can turn a relaxing jaunt in the park into a living nightmare, so a strong system that will resist your dog’s sudden charges without breaking or failing is of nearly immeasurable value. These retractable leashes come in three colors: black, blue, and red. As an electronics brand, TaoTronics has been enjoying steady growth since the company’s inception in 2008. They focus on providing quality electronics that fulfill consumer need with elegance and function. Our Silver Pick, the TaoTronics retractable dog leash is a great example of how excellent design and sturdy construction can help to create a truly groundbreaking product. The first thing you’ll notice about this Taotronics retractable is that the design is very ergonomic looking; in fact, the handle is coated in a grip-resistant rubber that will feel comfortable, even when under the load of a straining dog. The grip is also fairly large, so people with larger hands won’t have to sacrifice the grip that a full four fingers of holding can afford. 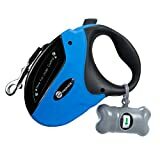 The grip smoothly tapers into the leash containment area and this section is colored a light blue that is accented with black sections. The leash feeds from the top of the housing and is colored a semi-metallic grey. It is also comprised of durable nylon that simply won’t break, regardless of your dog’s efforts. When it comes to measurements, this retractable dog leash is 6.1 inches from front to back, 4.2 inches in the main leash area, and 1.4 inches in width. This is also a fairly light leash at only 12.5 ounces. When it comes to its primary purpose, this retractable leash does a great job. It’s well constructed, and like our Gold Pick, has the ability to accommodate dogs of up to 110 pounds. The length of leash is a little shorter; you’ll have about 16 feet of maximum leash distance with this model. Also, some customers have complained about tangling with this model. When it comes to locking functionality, this retractable leash does a great job. Positioned near the output section of the leash containment area is a button. To stop the output of the leash, you can simply depress this button and hold it; your dog won’t be able to pull on it anymore. To lock, simply slide this same button forward and you’ll be able to remove your finger from the button without worrying about your dog pulling more of the leash out of the housing. To unlock, simply pull the button back again and your dog will once again be free to roam. In addition to the retractable leash, TaoTronics also has included a small plastic bone that attaches to the grip of the device. This small grey bone is actually a bag holder that will ensure that you always have poop bags on hand when you’re out walking your dog. Also, included with the leash is an LED light that will make night walking a less hazardous experience. Our Bronze Pick dog leash comes to us from the small company Buybar, whose motto is “Love them. Give them.” It’s through this simple guideline that the company seems to design products for pets. 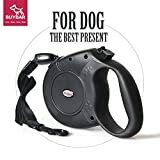 This device is sure to keep your favorite pooch safe and has more than enough leash to ensure that they can also frolic to their heart’s content. Firstly, this is a retractable leash that is comprised of ABS plastic that is both non-toxic and environmentally sound. Its external surface is very durable and able to withstand drops and bites from an overly excited dog. As durability seems to have been the chief design factor of this leash, there isn’t much in the way of aesthetic bells and whistles. Still, there are some aesthetic conceits such as a set of paw prints on the main rubberized housing of the grip itself. It is actually this rubberized grip that makes this one of the most comfortable to hold retractable dog leashes on our list. The entirety of the griping surface, from palm rest to knuckle guard is soft, yet textured enough to help you maintain your grip on a struggling canine. Its measurements are 6.2 inches from front to back, 5 inches in diameter for the leash housing, and the device is 1.5 inches in width. It also weighs the same as our Silver pick, a relatively light 12.5 ounces. When it comes to the functionality that you’d expect from this type of device, this retractable leash performs admirably, if a bit simply. To stop the leash from outputting the internal nylon rope, simply apply intermittent pressure to the large, squarish button on the top of the grip. To fully lock it, press down on this same button firmly to click it into place. To unlock, apply pressure again to the button and it should come free of the housing and allow the leash to be extended again. When it comes to performance, this leash can handle a dog that weigh up to 100 pounds and has a maximum leash output of 26 feet. This heightened amount of range will ensure that your dog will have plenty of room to roam and satisfy the instincts that make these animals so naturally curious. You can get this retractable leash in two colors; black and red. The red version does also sport some black highlights as well. Need to purchase a retractable dog leash that will control an excitable dog, but you are a baller who can sometimes be on a budget? Fortunately, Aipet has a solution that will solve all of your leash needs at a low price. Aipet is another relatively small pet care manufacturer and their products range from these types of retractable leashes to pet watering systems. The first thing you might notice about this retractable dog leash is that it’s very small, especially when compared with our gold through bronze picks. Even people with medium sized hands will be hard pressed to fit all of their fingers in the grips at a time. Also, this retractable leash has a much lower weight tolerance than the others on our list. The heaviest dog that it can accommodate is a 25 pound pooch, so consider this if you are thinking about purchasing it. Also, since this was designed with smaller dogs in mind, you’ll only get around 10 feet at the maximum extension level. Comfort-wise, despite the smaller grip and the plastic uni-body design, this is actually a fairly comfortable retractable dog leash. The grip actually sports finger depressions, so that you can have extra support when your dog tries to take off running. Also, the unit supports two buttons for controlling your pet; the button closest to your hand controls the stopping and locking functions of this leash and the button closest to the leash itself controls unlocking. A leash that has brighter colors is more recognizable by pedestrians who may be walking around you and your dog. If a runner is going between you and your pet, they can trip over a leash that seems to blend into the asphalt and that sudden tension of them falling over your leash can harm your dog. While black leashes can be ok to use, especially in grassy areas, a colored leash may be something that’ll you’ll want to consider in urban environments. A good rule of thumb for purchasing a leash that’ll be easy to recognize is the brighter the better. If you select a leash that doesn’t have bright colors, you can think about using flush, semi-reflective neon tape to make the leash material more visible; but be careful; you don’t want to add something that can jam the extension mechanism. The type of retractable leash can vary by several factors. The first is the size of your dog, some retractable leashes aren’t designed for very large dogs, and you’ll discover that a larger canine can quickly break apart the delicate components that would stop a smaller dog in its tracks. Conversely, the same can be said about retractable leashes that are designed for big pooches; a smaller dog might easily free him or herself from one of these types, and then you’ll have a situation where your dog can get into a lot of trouble; especially if there are a lot of people around or nearby traffic. Nylon – This is the material that you’ll most likely encounter in a large percentage of the dog leashes on the market. It’s strong, lightweight, and easy to lock when you need to keep your buddy at a relatively close range. Cord – This material is somewhat springy but also is relatively strong and will keep the leash safely locked if you want to restrict your dog’s range. Unfortunately, if this material does break, you can expect it to snap back, so beware of the potential injury that this situation can cause. 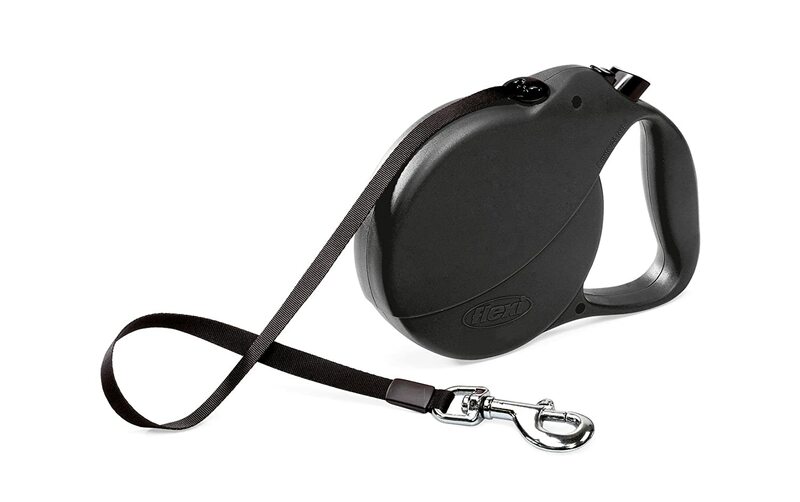 Leather – Many of the retractable dog leashes on the market have leather components that do not fully retract into the housing of the main device. These leather ends are strong and will feel more comfortable for you and your dog. Canvas – Canvas retractable dog leashes are similar to the leather type, and have a much more natural feel to them than the nylon or cord varieties. Should You Use a Collar or a Harness? Collar – With a collar you have more aesthetic customization choices. If you want your pooch to come off as a princess, there are plenty of collar options out there that can be perfect for this identity. Unfortunately, collars aren’t typically very secure, and when they are, they can present a danger to a dog who likes to test the boundaries of his leash often. You can safely choose a collar if you have a mild-mannered dog, so take into account your dog’s personality when choosing to use a collar with your retractable leash. Harness – This is the perfect option for dogs that like to run and sometimes pull hard on their leash. Since it’s not positioned exclusively around their necks, harnesses evenly distribute the force of a sudden stop along the front quarters of your dog. Also, these are best for those types of breeds whose head and neck shape makes it easy to simply slip out of a collar and run freely. Taking your pooch on a walk is healthy for both you and your best canine friend. 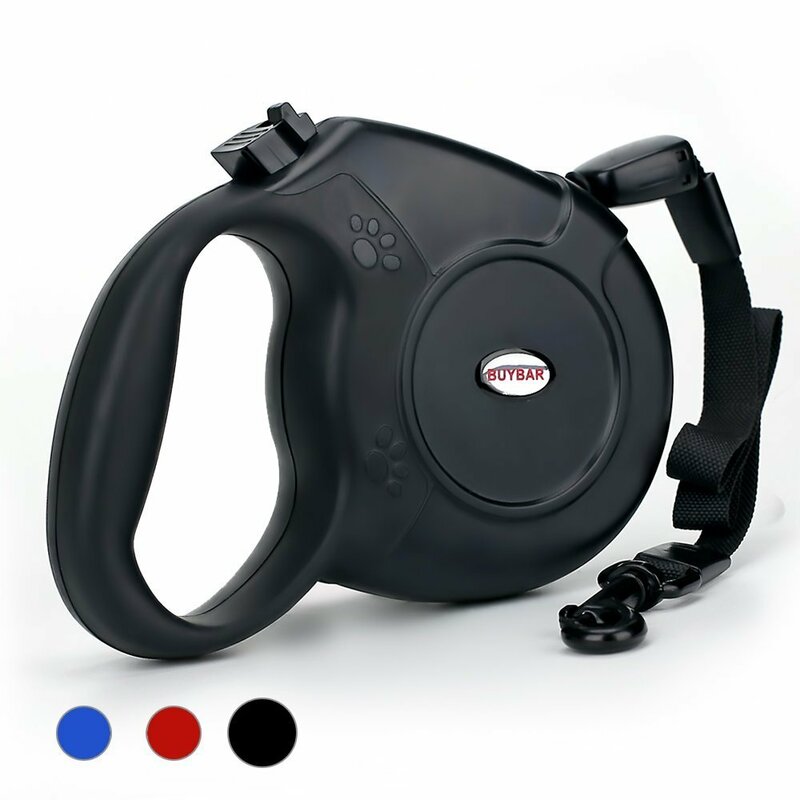 We hope that this listing of great retractable dog leashes helps you find a unit that will make you want to take your favorite pet on long walks where his or her need to explore is fostered and nurtured. If these items don’t work for your need, don’t neglect to use our pre-purchase considerations to help you find a device that’s more in line with what you want out of one of these devices.